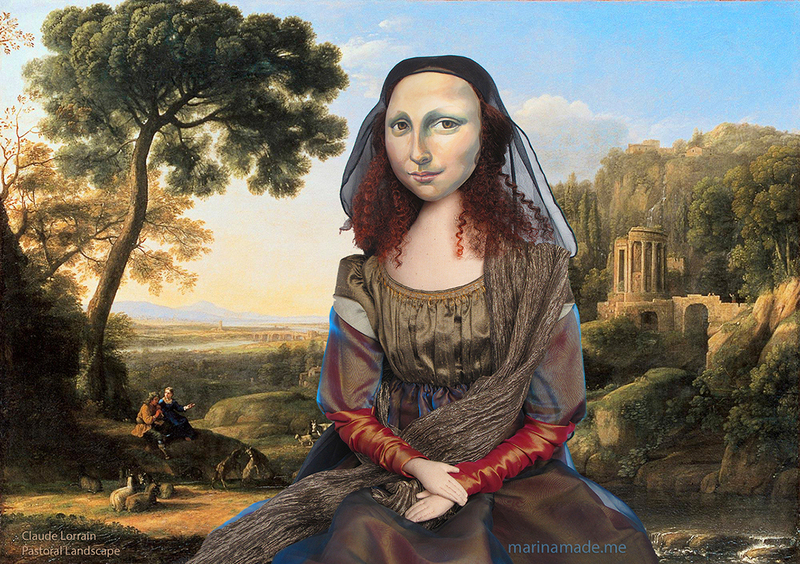 Just Mona Lisa muse with a Photoshop collage of Leonardo da Vinci’s painting behind her, by Marina. 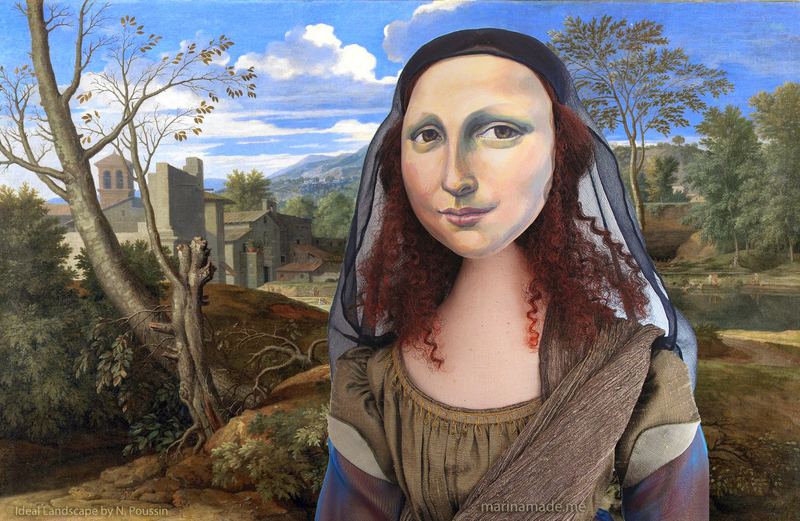 The thought of making a Mona Lisa muse was compelling yet daunting. In some ways she is the ultimate art muse, having a face that is recognised throughout the art world and beyond. 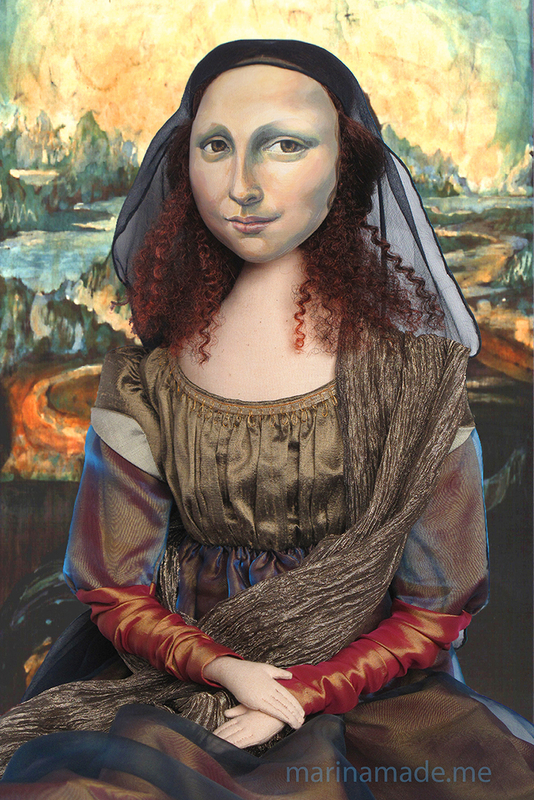 Her mysterious gaze and enigmatic smile would be difficult to capture, her 16th century dress intricate and problematic to construct, or get right; and aside from being one of the most recognised portraits in the history of art, the Mona Lisa is also one of the most widely reproduced art works ever. She would be a serious challenge, but I had to have a go. The most challenging part of the project was of course her face; not only had I to make a convincing portrayal but I had to paint it on a three dimensional surface. 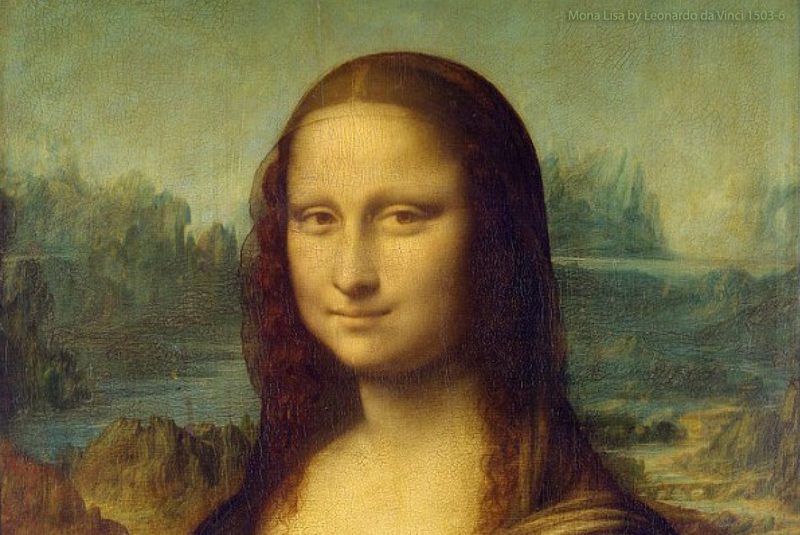 In Leonardo’s painting Mona Lisa face is slightly turned to the right, showing more of her left side, this made it complicated when painting it in the round. 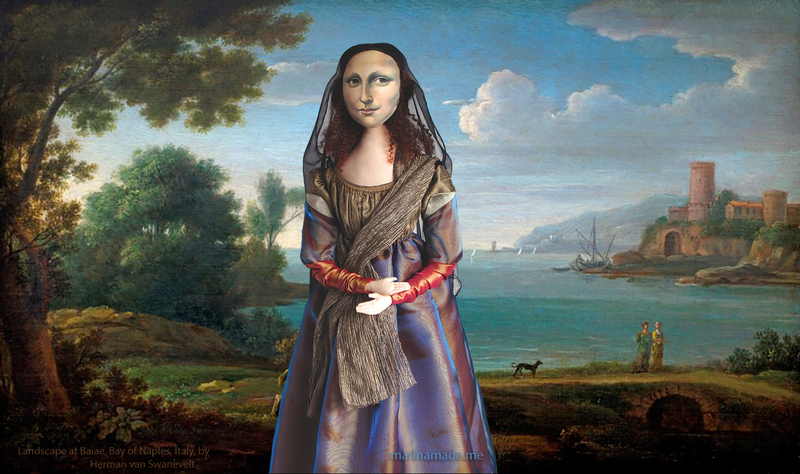 I researched 15th & 16th century Italian fashion to try to understand Mona Lisa’s outfit and made several patterns and toiles before constructing her dress. 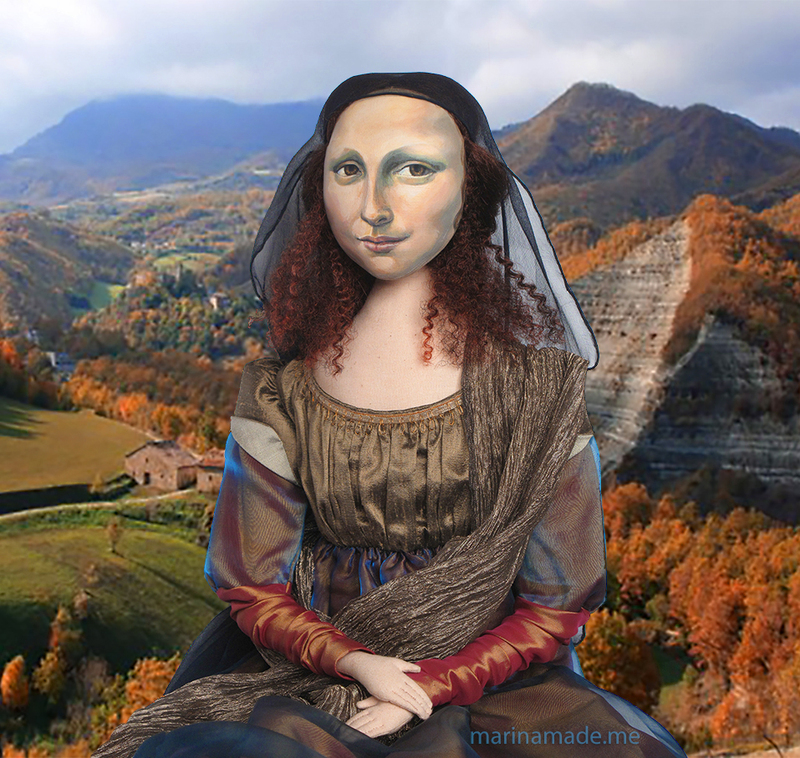 Mona Lisa muse with batik “Leonardo style” Italian landscape, by Marina Elphick. The website digitalphotoalchemy.com was useful to help with the colours of her dress, giving me an indication of what the silk fabrics would have originally looked like. 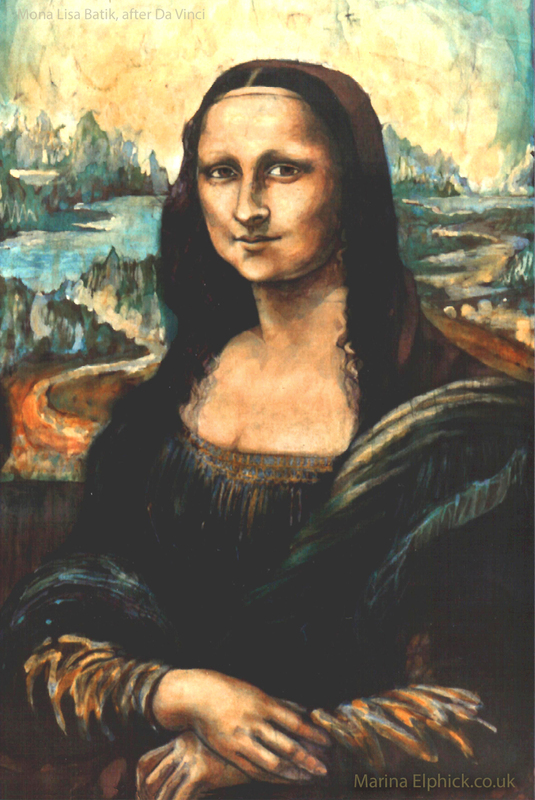 The Mona Lisa is probably the most well-known and most famous art work of all time. It was painted by the celebrated Italian Renaissance artist, Leonardo Da Vinci (1452-1519), between 1503 and 1506. This image is an enhanced photo of Mona Lisa showing the colours as they would have been, when Leonardo first completed the painting. The blues were more blue and the reds richer. 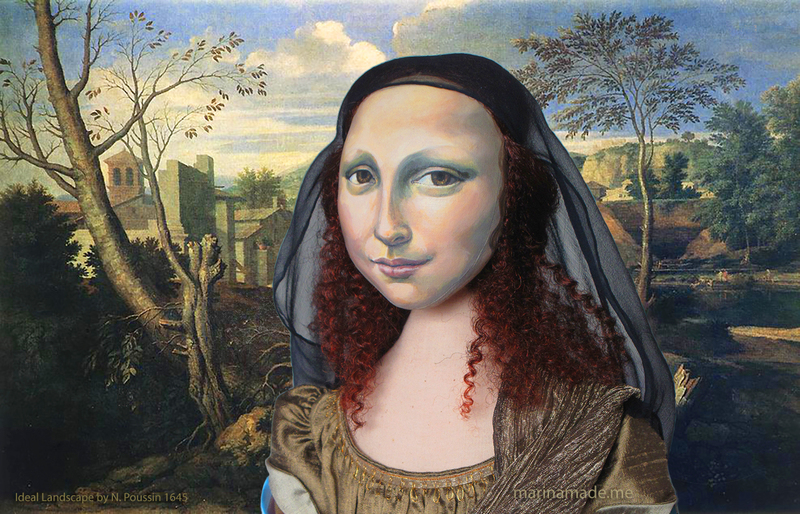 I used this version as reference for my Mona muse’s clothing. 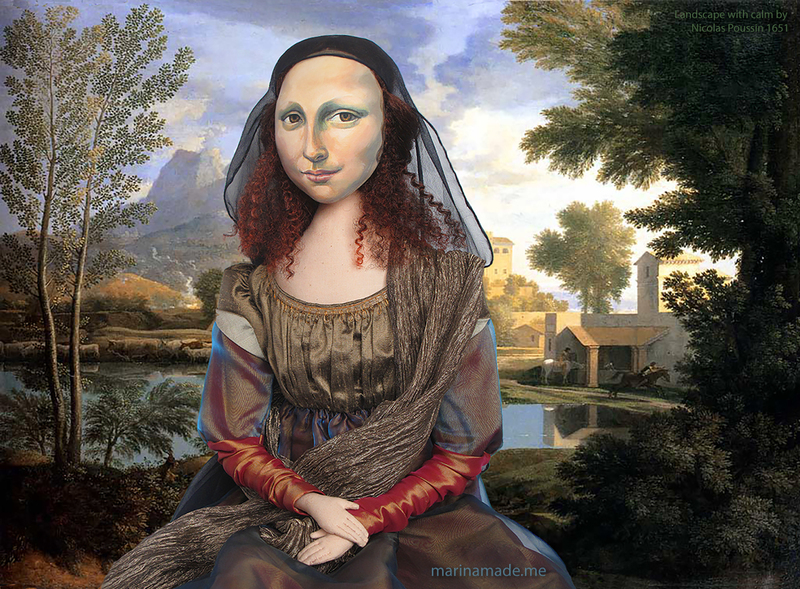 The original Mona Lisa portrait by Leonardo da Vinci, painted between 1503-06 on poplar wood panel, 77cm x 53 cm. It has suffered from warpage and the darkening of varnishes over the centuries. The portrait was commissioned by Lisa’s husband, Francesco Del Giocondo, who was a wealthy silk merchant. The painting was to celebrate their home’s completion, as well as to mark the birth of their second son, Andrea. 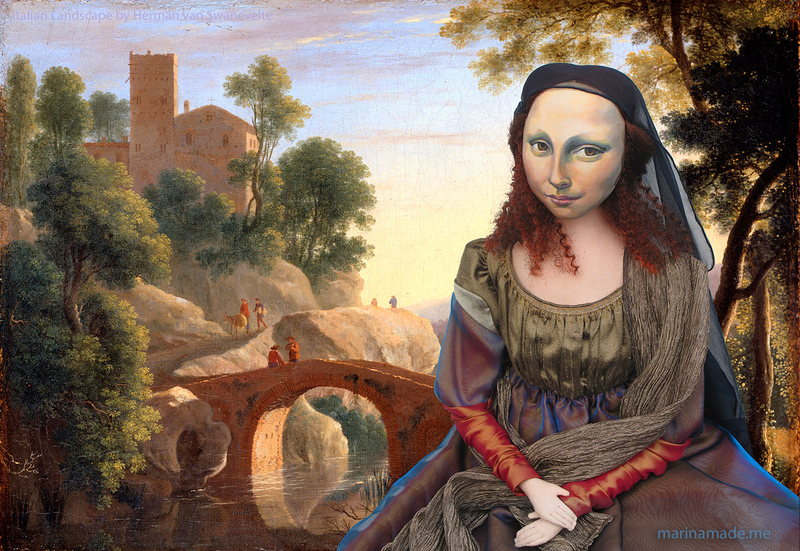 Lisa is portrayed dressed in the 16th century Florentine fashion of her day and is seated in a visionary, mountainous landscape setting. Leonardo was one of the first painters to use aerial perspective and places behind her a vast panorama which recedes from undulating hills, valleys and rivers to icy mountains. Winding paths, and a distant bridge give only the slightest hint of human presence, offering an overall feeling of calm. Mona Lisa’s distinctive gaze and enigmatic smile have made her face one of the most recognisable and most debated on for centuries. Mona Lisa, detail of her face, by Leonardo da Vinci. 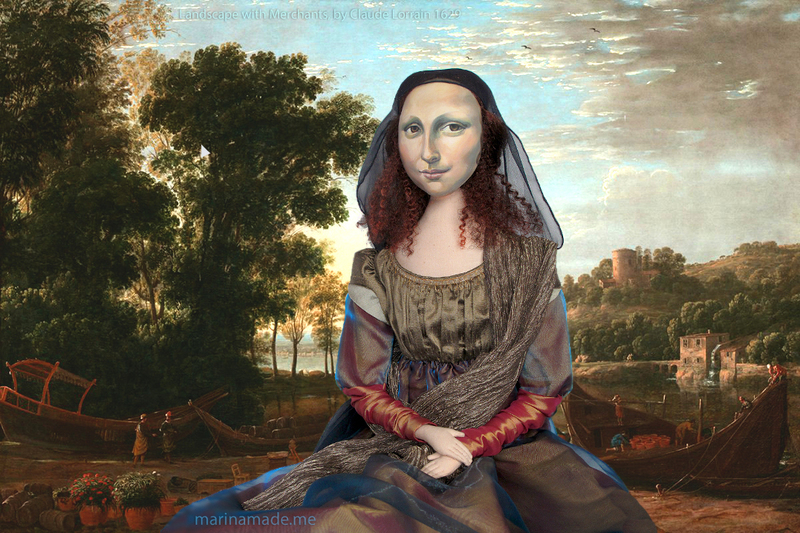 Mona Lisa sits upright in a “pozzetto” armchair with her arms folded, in a reserved posture. Her contemplative gaze is fixed on the observer. 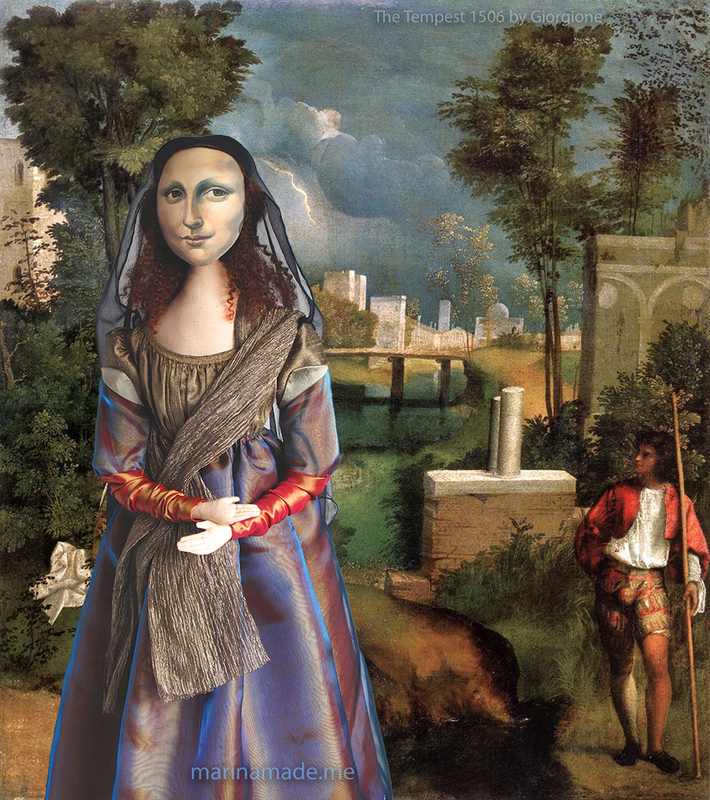 She appears alive to a curious extent, which Leonardo achieved by his method of not drawing outlines (sfumato). He described this technique as blending colours, without the use of lines or borders, “ in the manner of smoke”. His soft blending and fine shading create an illusive, illusional portrayal, imbued with a sense of mystery and romance. Leonardo Da Vinci was a master of his art but he was also a scientist and inventor. His interest in anatomy and drawing from the human form, (involving the study of actual human corpses) meant he was able to draw and paint it more accurately than any other artist of his time. 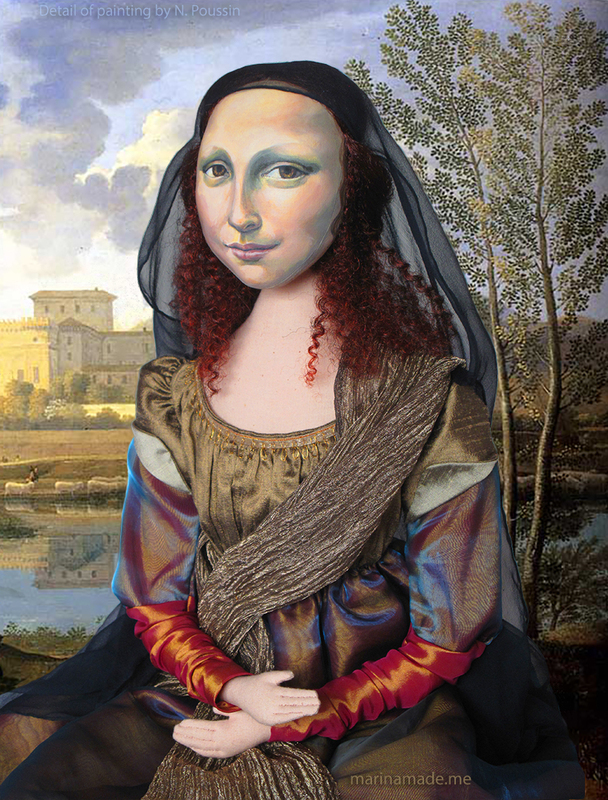 Originally commissioned in Italy, the Mona Lisa now resides in the Louvre, Paris. Francesco Del Giocondo never received the painting and there are no records of payment or transaction. 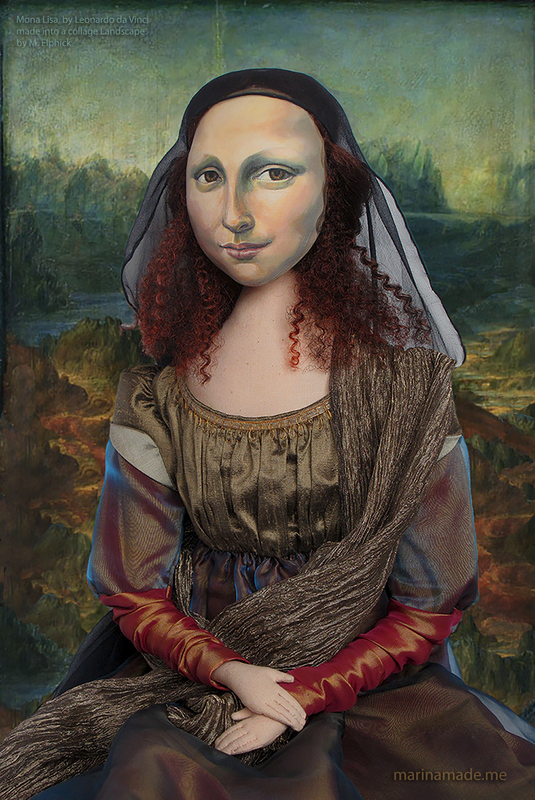 For da Vinci, the Mona Lisa was forever a work in progress, as he attempted perfection. Leonardo never parted with the painting. In 1911 the painting was stolen by Italian patriot Vincenzo Perugia, who believed the painting belonged to Italy, (he was an employee of the Louvre at the time). It was retrieved in 1913 when Perugia tried to sell it to a gallery in Florence. It has survived vandalism twice, when acid was thrown at the bottom half causing serious damage, then another vandal threw a rock at the work, removing a chip of paint from near her elbow. It was carefully repaired and afterwards security was heightened. Today, the Mona Lisa hangs in the Louvre Museum in Paris, France, secured behind bulletproof glass and regarded as a priceless national treasure seen by millions of visitors each year. 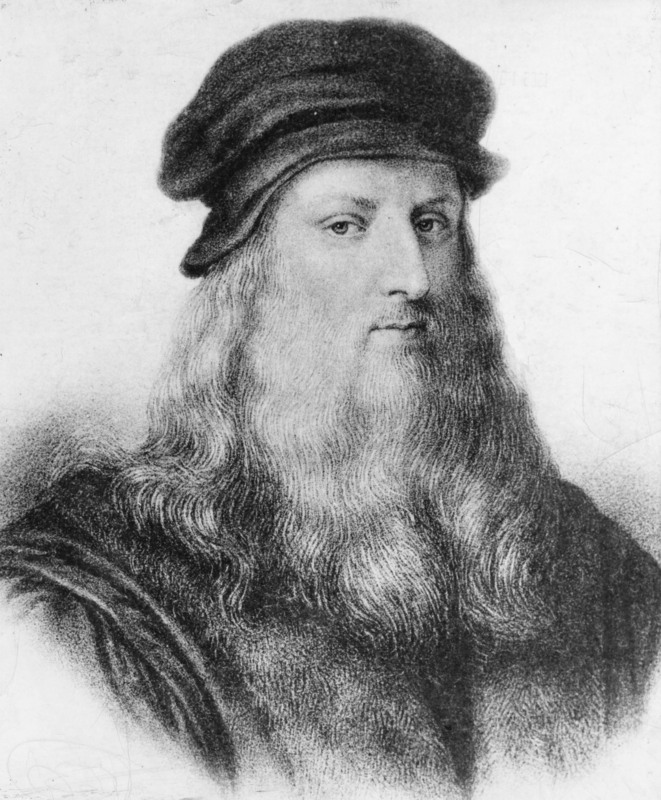 Portrait of Leonardo da Vinci engraved by unknown craftsman. 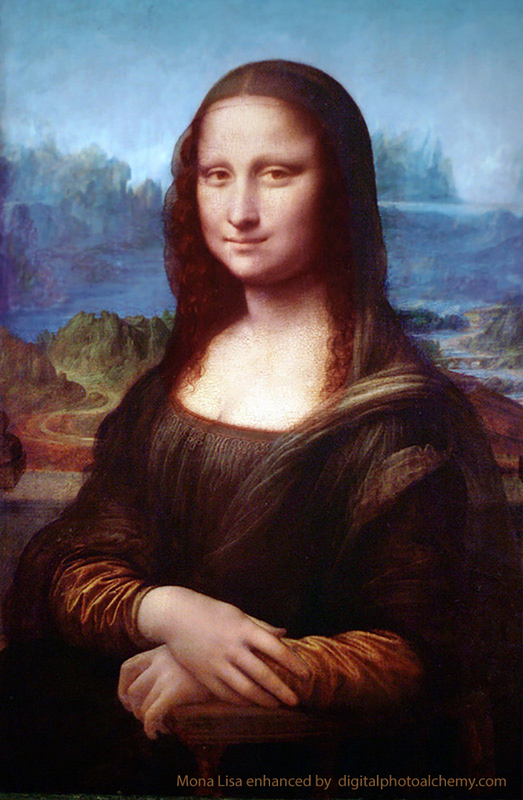 Lisa Gherardini was born in Florence on June 15th 1479, on Via Maggio. Lisa’s father, Antonmaria di Noldo Gherardini, owned six farms in Chianti that produced wheat, wine and olive oil and raised livestock. Sadly Gherardini lost two wives in childbirth, Lisa’s mother, Lucrezia del Caccia was Gherardini’s third wife and she gave birth to his seven children, of whom Lisa was the eldest, with three sisters and three brothers. 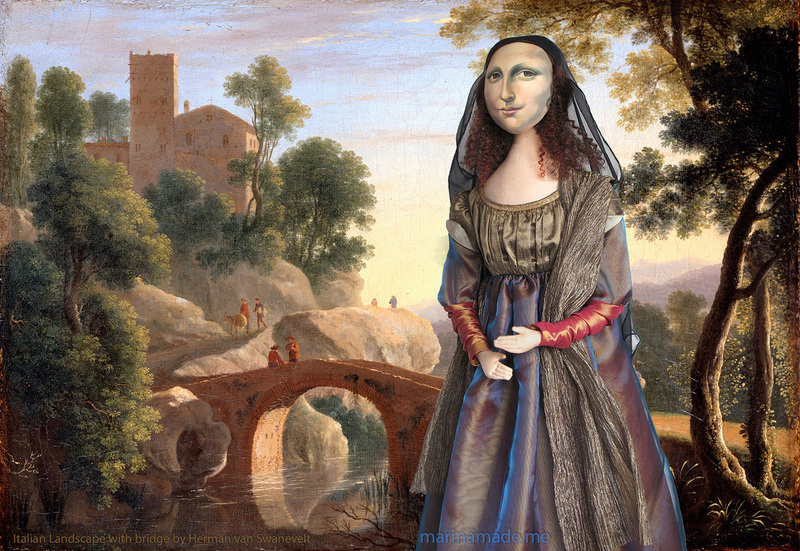 Mona Lisa muse, by Marina Elphick, with a Nicolas Poussin painting, “Ideal landscape”. Lisa’s Florentine family was old and aristocratic but over time had lost their influence. They were well off, but not wealthy either and lived on farm income in a city that was one of the largest in Europe at that time. 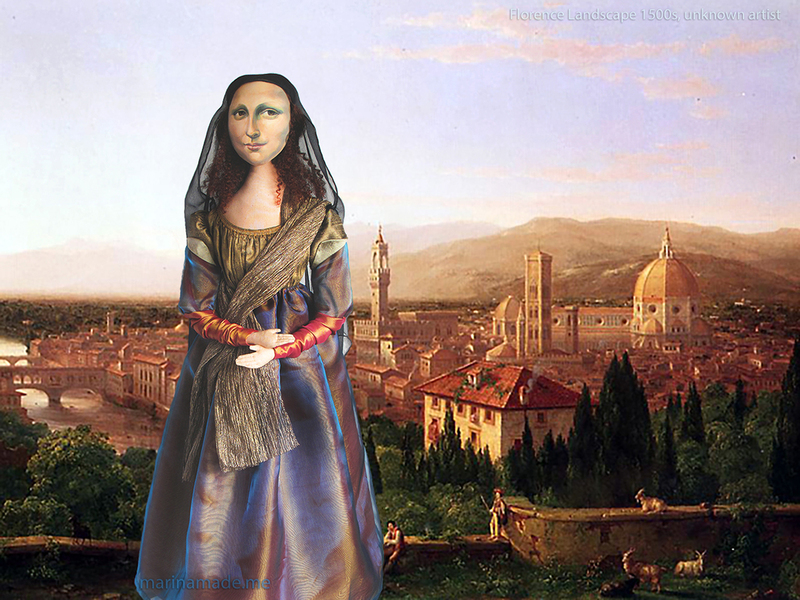 Mona Lisa muse overlooking Florence, in a painting by an unknown artist, 1500s. She is standing in a rural area outside the city which would 70 years later become the famous Boboli Gardens. The couple lived a middle-class life in Florence, neither poor nor well-to-do. Lisa’s marriage would have increased her social status as her husband’s name was a respected “old name” of a well regarded family, known throughout Florence and Tuscany. It is thought that the marriage was indeed about love, as Lisa’s dowry was small, a sign that the Gherardini family was not wealthy at the time. Lisa and Francesco had five children between 1496 and 1507, Lisa also raised a son from Francesco’s second marriage, who was about a year old when his mother died. 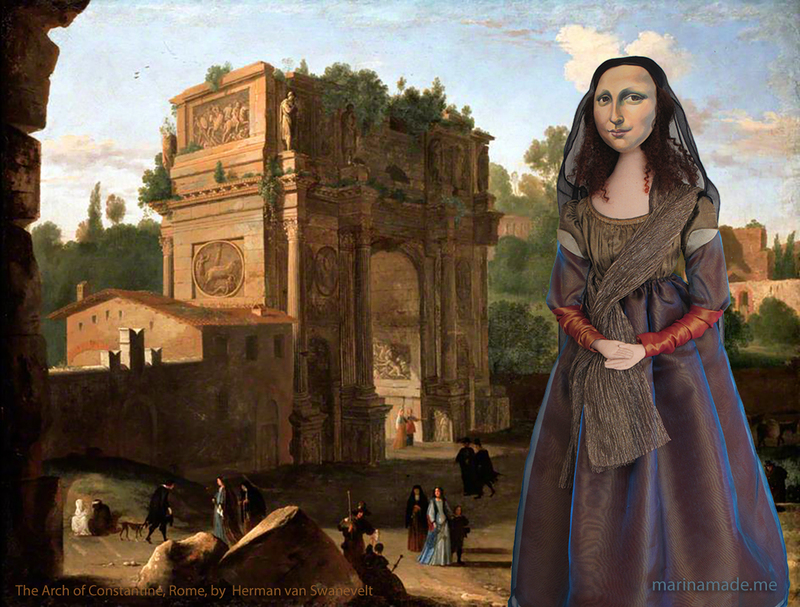 Mona Lisa muse at The Arch of Constantine, Rome, painted by by Herman van Swanevelt. Francesco del Giocondo’s success in securing the services of the great Leonardo da Vinci to paint a portrait of his wife, was in fact an extraordinary achievement, considering the elevated circle in which Leonardo was usually assigned. He is thought to have commissioned Lisa’s portrait to celebrate both Andrea’s birth and the purchase of the family’s home. In addition to his prominence as a businessman and merchant, Francesco played an important part in Florentine politics. He was elected to the Dodici Buonomini in 1499 and to the Signoria in 1512. There is no doubt that Francesco achieved not just great wealth, but significant influence and status in Florence. Their daughters, Camilla and Marietta became Catholic nuns, but Camilla died at only 18. Lisa developed a relationship with Sant’Orsola, a Convent held in high regard in Florence, where she was able to place Marietta in 1521. Marietta became a respected member of the convent and worked in a position of some responsibility. He left her very well provided for, returning her dowry and giving her clothing and jewellery. As a widow she lived in the care of her son Piero, and eventually her daughter, Marietta. 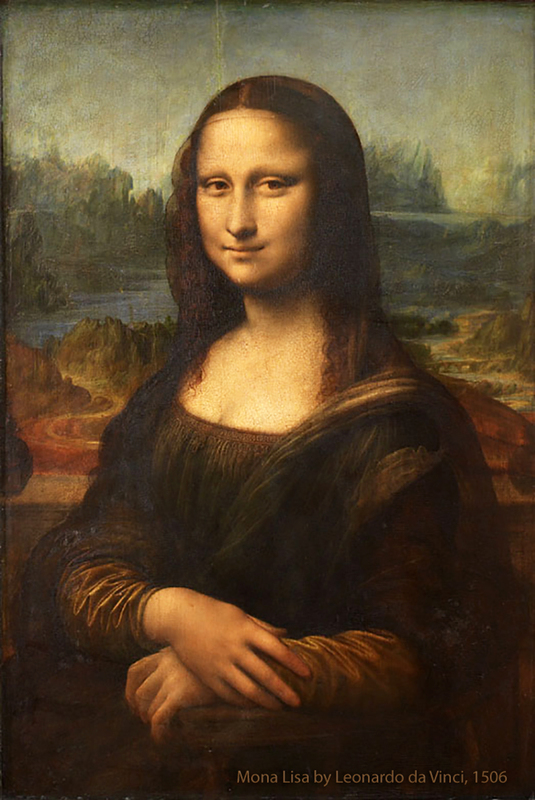 Lisa del Giocondo or as we know her, Mona Lisa, died four years after her husband in 1542, she was aged 63 and was buried at the convent of Sant’Orsolo. 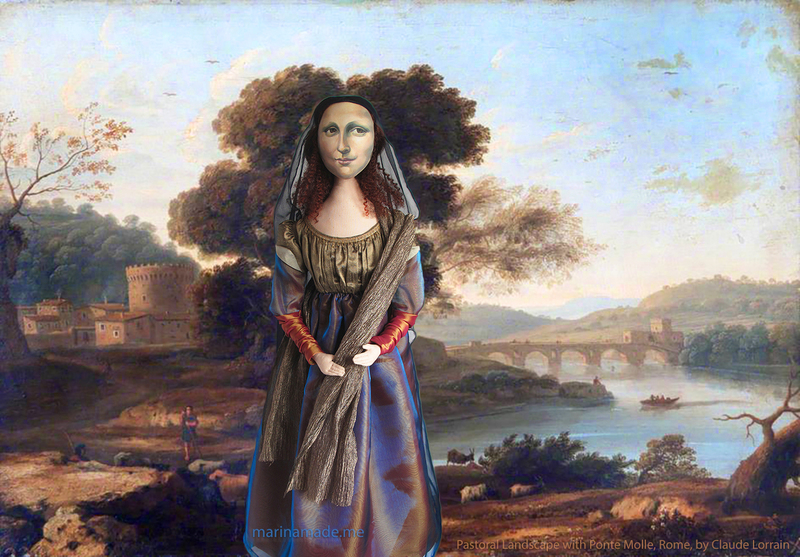 Mona Lisa muse, handmade soft sculpture, dressed in silk and rayon, with metallic thread embroidery. Made by Marina Elphick. 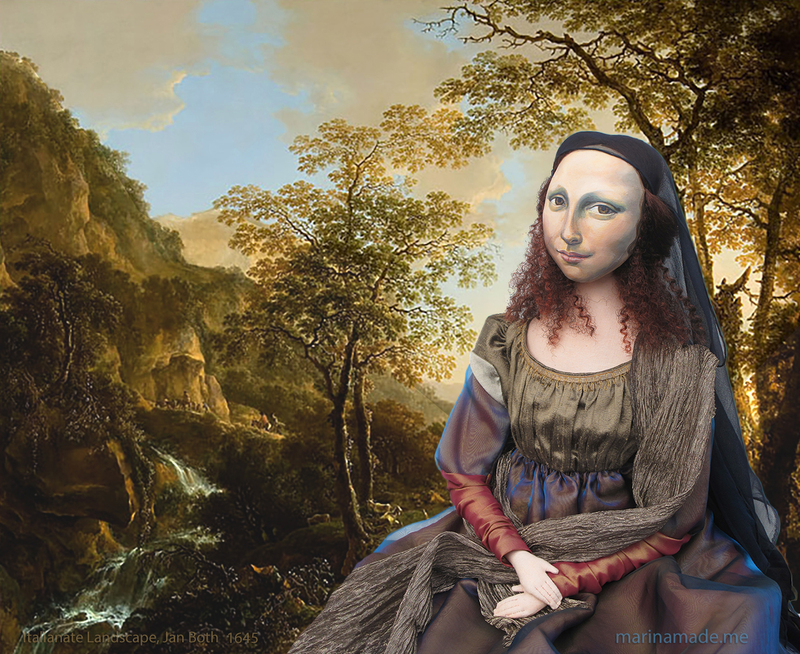 Marina’s Mona Lisa muse in various settings, against paintings by Claude Lorrain, Nicolas Poussin and Herman Van Swanevelt, as well as batik and collage by Marina. admire your creativity! Congratulations yet again! Thank you Barbara, so good to have your support in this project.